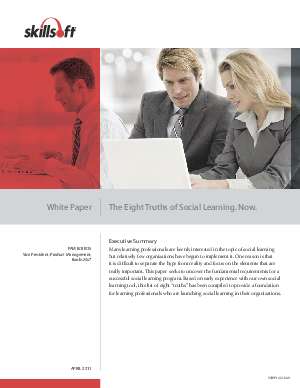 > Skillsoft > The Eight Truths of Social Learning. Now. Many learning professionals are keenly interested in the topic of social learning but relatively few organizations have begun to implement it. One reason is that it is difficult to separate the hype from reality and focus on the elements that are really important. Based on early experience with our own social learning tool, this list of eight "truths" has been compiled to provide a foundation for learning professionals who are launching social learning in their organizations.